Visiting Hang Luoc market is not only to enjoy Tet holiday but also an elegant pleasure of Hanoian because it is only held once a year. 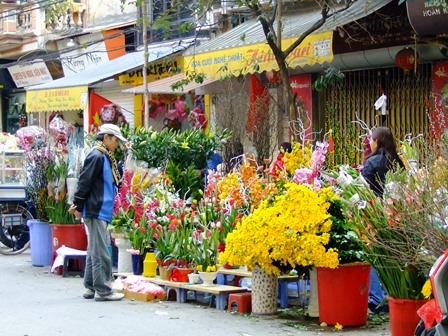 Hanoi capital has abundant place to buy flowers for Tet holiday but to many people, Hang Luoc market always has its own position and brings back traditional atmosphere. Has been built since 20 century, the Hang Luoc market is considered the oldest flower market in Hanoi. Under Le dynasty, Hang Luoc street was the land of Phu Tu village and Vinh Tru village where was famous for making combs. In 1912, Hang Luoc became well-known flower market in Thang Long with various kinds of flowers from peach in Quang Ba, Nhat Tan, daisy flowers of Ngoc Ha to new flowers in Bach Thao garden. Hang Luoc street nowadays is located in Hang Ma ward, Hoan Kiem district, in 264 meters long, stretches from Hang Cot street to Cha Ca street. More than 100 years from the first meeting, except 1947 Hanoi in battlefield, Hang Luoc annually holds the flower market. The market begins from 23rd of December to 30th of December. During this period, peach, kumquat and various flowers gathered from all parts of country makes the small street busier on occasion of Tet holiday. 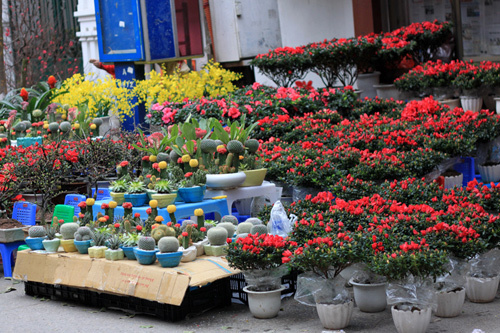 It is called Hang Luoc flower market but it usually lasts from Hang Chai street to Hang Ma street, Hang Dong street, fresh flowers and bonsai are filled everywhere. Unlike Quang Ba flower market, flowers are arranged in big or small piles, in Hang Luoc flower market, flowers are carefully selected and sold in separate areas. Traditional flowers are preferred such as peach, kumquat, chrysanthemum, gladiolus, dahlia, violet, narcissus, etc. In which peach flowers are hunted by many people near and far. Due to be located in heart of the Old Quarter, it is quite rare to find wild peach, mainly red peach blossom branches. It is enough to dazzle buyers with various flowers. Not only that, golden color of daisies and orange pink color of gladiolus in the Old Quarter has strange attraction. Although it is very crowded, visitors do not flock to purchase, they just leisurely walk while watching until they want to buy, they will ask for price and bargain. Beside fresh flowers, people can find various kinds of silk flower baskets. Although it is not special in Tet holiday, silk flowers and paper flowers in Hang Luoc are much in demand. They also sell special fruits such as: grapefruit wine-gourd, Buddha’s hand, etc, together with lucky envelopes. No matter if some one searches for his necessary thing, thus he/she wants to be available that in detail, thus that thing is maintained over here. Greetings from Idaho! I’m bored at work so I decided to check out your blog on my iphone during lunch break. I enjoy the information you present here and can’t wait to take a look when I get home. I’m shocked at how quick your blog loaded on my phone .. I’m not even using WIFI, just 3G .. Anyways, good site! Thankfulness to my father who told me regarding this web site, this blog is truly amazing. We stumbled over here by a different web address and thought I might check things out. I like what I see so i am just following you. Look forward to exploring your web page yet again. Fantastic web site. Lots of helpful info here. I am sending it to a few friends ans also sharing in delicious. And obviously, thank you for your sweat! Remarkable! Its in fact awesome post, I have got much clear idea concerning from this piece of writing. Thank you for every other informative site. Where else could I get that kind of info written in such an ideal method? I’ve a venture that I’m simply now operating on, and I’ve been on the glance out for such info. Hello There. I discovered your blog using msn. That is an extremely smartly written article. I will be sure to bookmark it and return to read more of your helpful information. Thank you for the post. I will definitely return. Hello, i think that i saw you visited my weblog thus i came to “return the favor”.I am attempting to find things to improve my site!I suppose its ok to use a few of your ideas!! Its not my first time to pay a visit this website, i am visiting this web site dailly and obtain good facts from here every day. Great web sire you’ve got here.. It’s hard to find high quality writing like yours these days. I honestly appreciate individuals like you! Takee care!! actually loved account your weblog posts. Anyway I will be subscribing on your feeds and even I fulfillment you get entry to consistently rapidly. I just want to tell you that I’m all new to weblog and really loved you’re page. Almost certainly I’m want to bookmark your website . You really come with exceptional article content. Kudos for sharing with us your blog site. I am in fact thankful to the owner of this web page who has shared this impressive paragraph at here. of your excellent post. Also, I’ve shared your web site in my social networks! I just want to mention I’m newbie to weblog and definitely liked you’re web-site. Probably I’m likely to bookmark your site . You actually have terrific articles. Kudos for sharing with us your web-site.